Summary: In the tradition of Out of My Mind, Wonder, and Mockingbird, this is an intensely moving middle grade novel about being an outsider, coping with loss, and discovering the true meaning of family. Willow Chance is a twelve-year-old genius, obsessed with nature and diagnosing medical conditions, who finds it comforting to count by 7s. It has never been easy for her to connect with anyone other than her adoptive parents, but that hasn’t kept her from leading a quietly happy life... until now. Suddenly Willow’s world is tragically changed when her parents both die in a car crash, leaving her alone in a baffling world. The triumph of this book is that it is not a tragedy. This extraordinarily odd, but extraordinarily endearing, girl manages to push through her grief. Her journey to find a fascinatingly diverse and fully believable surrogate family is a joy and a revelation to read. - from goodreads. there was nothing complicated about this book; there were no intricate details, no scattering of metaphors and similes, no overuse of alliteration - the writing just was, and that's what i loved about it. it was simple, unaffected - yet it captured the personalities of the characters perfectly, and drew me in like a fishing rod reels in its catch. i finished the book in one sitting. it was night. the house was slumbering giant - my family were all in various rooms but i didn't feel alone, because i had the company of the characters. "all reality, i decide, is a blender where hopes and dreams are mixed with fear and despair. only in cartoons and faiytales and greeting cards do endings have glitter." willow was like a breath of fresh air for me. she was like-able, mature, genuine; earnest - and had none of the annoying traits and mannerisms that some characters have. she felt real. holly goldberg sloan has created characters that make you want to be friends with. they aren't flawless, they can't shoot a bow and arrow ans hit bulls-eye on their first attempt (or maybe Quang-ha can, i don't know), they don't have only four fears or a bionic arm; but they are superheros in their own way. they are the kind of characters that you can relate to; that give you hope and make warm your heart. they're believable. they show that you can make changes for the better, and those small changes could eventually make bigger ones if you try hard and don't give up. "that's the thing about time. a second can feel like forever if what follows is heartbreak." i can't really choose a favourite character because they were all individual and endearing. Mai was like the determined warrior that no-one said no to, and her mother Pattie was just like her; obstinate and set in her ways - yet able to love deeply and comfort Willow whom she had previously never met. she conjures up an image of a bee to me: small and sweet, but with a nasty sting in her tail. Quang-ha was probably the most intriguing character in my opinion. almost always with a scowl on his face, he seemed to never listen, yet always observed, and i would have liked to have see more of him in the story, to really get to know his character. "i don't see anything anymore. but i can't help but notice." there was one huge thing that bugged me in this story though: the fact that at the end of the book it is shown that Pattie has enough money to buy an entire building - yet before she had let her children live in an unconverted garage, and only decided to reveal her savings to help willow. she never thought of her children? this was part was really unbelievable and irked me slightly but other than that u enjoyed this book immensely. "a genius shoots at something no one else can see, and hits it." 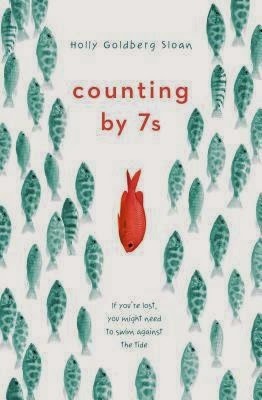 counting by 7s was a beautiful and entertaining story of unexpected friendships and building family ties, featuring a group of charismatic characters that will stay in the readers mind long after the last word has been read. it shows how you should never believe that this is the end if something bad happens - and portrays how change, whether it be big or small, can affect a person for the better; as long as your outlook on life remains positive and you have people around you who will support you no matter what. *thank you to the Guardians Children's Books for sending me this in exchange for an honest review. I'm actually pretty fond of a lot of middle grade books. They always have some sort of magical element about them so I won't just be walking by this one if I see it in a book shop. I love stories where the characters really make you feel the entire way through and this MC sounds inspiring! I'm also loving that the writing style connected to you even though there was nothing extraordinarily special about it.